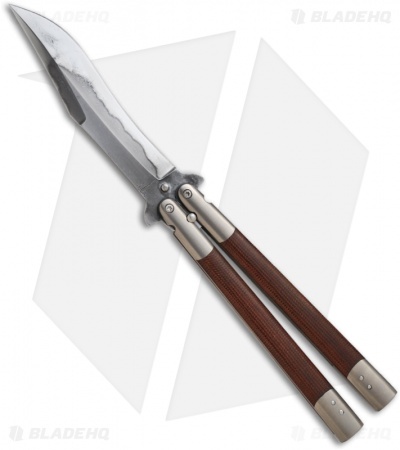 We ran into Chuck Gedraitis at the 2011 Blade Show and were pleased to discover that he is making custom butterfly knives. Chuck’s style is elegant and straightforward. Truth is, we liked his balisong knives so much that we bought every one he had at the show. Balisong #50 has a hamon finished 1095 steel clip point style blade. The handles are titanium with natural Micarta inserts that sit flush with the handle edges. The spacers and hardware are satin finished stainless steel. You'll notice that Balisong #50 doesn't have a latch, which some will really appreciate. Comes with a fleece lined storage pouch. 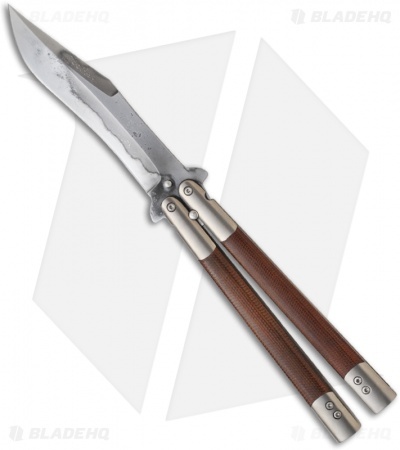 The #50 Balisong has great action that is sure to please butterfly enthusiasts!